England coach Roy Hodgson will announce his squad for the 2014 World Cup on Monday, 12 May - a day after the climax of the Premier League season. 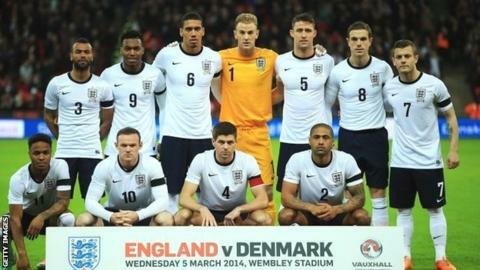 Hodgson will name a 23-man squad, plus seven standby players, before confirming his final squad on 2 June. England face Peru on 30 May prior to that announcement and play two more friendlies against Honduras (4 June) and Ecuador (7 June) in Miami. They begin their World Cup campaign against Italy on 14 June. England then travel to Sao Paulo to face Uruguay on 19 June before a final Group D match against Costa Rica in Belo Horizonte on 24 June. "I'm not going to make decisions in the last week or two of the season, which is a notoriously bad time to judge talent," said Hodgson. "I don't judge players on their last-minute form. Nothing that happens in the last four games, in terms of form, is going to affect me." Tottenham winger Andros Townsend looks set to miss out after he was ruled out for up to 10 weeks on Wednesday with an ankle ligament injury.